[161 Pages Report] The military power solutions market is projected to grow from USD 5.35 Billion in 2016 to USD 9.01 Billion by 2022, at a CAGR of 9.07% during the forecast period. The base year considered for the study is 2015 and the forecast period is from 2016 to 2022. The report analyzes the military power solutions market based on type (portable and non-portable), source (batteries, generators, fuel cells, solar power, and energy harvesters), application (air, land and naval), and wattage (low, medium, and high power), and subsegments across major regions, namely, North America, Europe, Asia-Pacific, and the Rest of the World (RoW). The report provides in-depth market intelligence regarding the military power solutions market and major factors, including drivers, restraints, opportunities, and challenges that may influence the growth of the market, along with an analysis of micromarkets with respect to individual growth trends, growth prospects, and their contribution. The report also covers competitive developments, such as long-term contracts, new product launches and developments, and research & development activities in the military power solutions market, in addition to business and corporate strategies adopted by key market players. Market size estimation for various segments and subsegments of the military power solutions market has been arrived at through extensive secondary research sources, such as Hoovers, Bloomberg Businessweek, Factiva annual reports and publications, among others, and in corroboration with primaries. Further market triangulation has been done with the help of statistical techniques using econometric tools. All percentage shares, splits, and breakdowns were determined using secondary sources and verified through primary sources. All possible parameters that affect the market have been accounted for, viewed in extensive detail, verified through primary research, and analyzed to acquire the final quantitative and qualitative data. This data is consolidated with detailed inputs and analysis from MarketsandMarkets, and presented in this report. 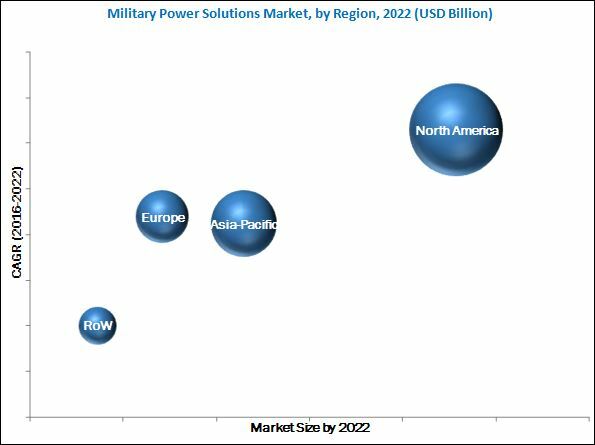 The military power solutions market ecosystem comprises power solutions manufacturers, such as Raytheon Company (U.S.), Arotech Corporation (U.S.), SAFT Groupe S.A. (France), SFC Energy AG (Germany), Advanced Conversion Technology, Inc. (U.S.), Concorde Battery Corporation (U.S.), and Energy Technologies, Inc. (U.S.), among others. The military power solutions market is projected to grow from USD 5.35 Billion in 2016 to USD 9.01 Billion by 2022, at a CAGR of 9.07% during the forecast period. This growth can be attributed to the emergence of modern warfare techniques. Furthermore, requirement for durable and maintenance free power sources for the military sector and increasing defense electronics budget in several emerging countries are factors that are expected to fuel the growth of the military power solutions market. The market has been segmented based on source, type, application, wattage, and region. Based on source, the military power solutions market has been segmented into batteries, generators, fuel cells, and solar power, among others. Fuel cells is expected to be the fastest-growing segment of the market, as they are being increasingly adopted due to their high storage capacity. Based on type, the military power solutions market has been segmented into portable and non-portable. The portable segment is expected to witness high growth, owing to the rising need for compact and lightweight power solutions. The military power solutions market, based on application, has been segmented into air, land, and naval. The land segment is projected to be the largest segment of the market. Rise in the demand of power sources used by soldiers, armored vehicles, UGVs, and tanks is estimated to increase the demand for military power solutions in the land segment. The military power solutions market, based on wattage, has been segmented into low, medium, and high power. The medium segment is projected to be the largest segment of the market. Rise in the demand of power sources used by soldiers, armored vehicles, UGVs, tanks is estimated to increase the demand for military power solutions in the medium power segment. Medium power sources are majorly used in ground vehicles that consume approximately 250 Watts of power. 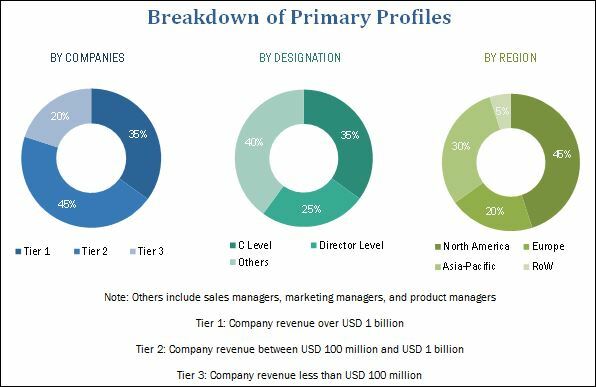 The geographical analysis of the military power solutions market includes regions, such as North America, Europe, Asia-Pacific, and the Rest of the World (RoW). North America is estimated to be the largest market for military power solutions in 2016. Countries such as the U.S. and Canada in the region have witnessed increasing military power solution deliveries in recent years. The markets in Europe and Asia-Pacific are also expected to witness significant growth, owing to the increase in demand for reliable, efficient, and long-lasting military power solutions in these regions. High initial cost of deployment can act as a challenge for the growth of the military power solutions market. Products offered by various companies in the military power solutions market have been listed in the report. The recent developments section of the report includes recent and key developments by various companies between 2006 and 2017. Major companies profiled in the report include Raytheon Company (U.S.), SAFT Groupe S.A. (France), Arotech Corporation (U.S.), and SFC Energy AG (Germany), among others. Contracts and new product launches were the key strategies adopted by the leading players in the military power solutions market. These strategies have enabled companies to strengthen their market share in the military power solutions market. 13.9 Advanced Conversion Technology, Inc. Figure 47 SWOT Analysis: Saft Groupe S.A. Figure 49 SWOT Analysis: Enersys Inc.